The regular season is over in Eastern Mass, and across the region the playoffs are set to begin. This will be our final installment of the Eastern Mass Power Rankings until after the state championship games at Gillette Stadium on December 5th. Until then, enjoy our look at the top teams in Eastern Mass at the end of an eventful regular season. Last Week: Ranked No. 1, defeated Sandwich 49-6. Another blowout league win gave the Rams the Atlantic Coast League championship and the top seed in Division 2 South. It remains to be seen if anyone in D2 can play with Marshfield, but we'll find out in the playoffs, which begin for the Rams Friday against 1-6 Quincy. Last Week: Ranked No. 2, defeated No. 10 BC High 28-0. The Hawk defense choked out another opponent, this time Catholic Conference rival BC High. Xaverian enters D1 South as the prohibitive favorite with a dominant defense and offense full of play makers. Last Week: Ranked No. 4, defeated Norton 35-7. The Panthers have been cruising the last few weeks, and enter a tough Division 4 South bracket with a ton of momentum. They'll open up postseason play at home against Apponequet, but challenges await with talented Foxboro, Hanover and Middleboro all in the bracket. Last Week: Ranked No. 3, lost to Bridgewater-Raynham 29-27 (OT). A heartbreaking overtime loss gave the Eagles their first blemish of the year, but SJP will still head into the D1 North playoffs as the top seed and consensus favorite. Last Week: Ranked No. 5, defeated Lowell 49-14. CC captured the Merrimack Valley title outright by blasting Lowell, and will move onto the Division 1 North playoffs with a head full of steam. As the No. 2 seed, crammed in between St. John's Prep (a team they lost a close one to) and Andover (a team they defeated), the Raiders have as good a shot as anybody to make it to Gillette. Friday night's home game against Lawrence will be the first step. Last Week: Ranked No. 6, defeated Wellesley 14-7. The Wildcats won their first league title in over 50 years in a Saturday thriller against Wellesley, locking up the top seed in brutal Division 3 Southwest in the process. First up for Milton is Norwood in what the Panthers hope will be a long playoff run. Last Week: Ranked No. 7, defeated Mansfield 14-13. North won a classic against Mansfield to capture the Hockomock Kelly/Rex and finish the regular season undefeated. Division 3 Southwest is a bear of a bracket, but the Red Rocketeers head in as the No. 2 seed, with a home game against Bishop Freehan on tap. Last Week: Ranked No. 8, defeated Quincy 33-13. The Dragons ended their regular season by locking up the outright Patriot League Keenan championship, and will now move onto the loaded Division 3 Southwest playoffs. Duxbury heads in as the No. 3 seed and will host Hopkinton Friday night. Last Week: Ranked No. 9, defeated Arlington 48-13. Reading captured the Middlesex League Liberty crown with a resounding win over Arlington, and will now turn their attention to the Division 2 North playoffs. The Rockets will host Malden Catholic Friday night to open their postseason. Last Week: Unranked, on a bye. 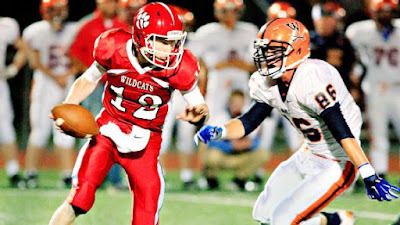 The Redmen had the week off, and move into our Power Rankings and the playoffs with one of the state's best defenses. Tewksbury heads into D3 Northeast as the No. 2 seed, but will be considered the favorite in the bracket by many. They'll begin the playoffs Saturday hosting Salem.